BEIJING, Aug. 1 (Xinhua) -- China must step up transforming its armed forces into a world-class military that is ready to fight and win wars as the country will never compromise on defending sovereignty, President Xi Jinping said Tuesday at an Army Day celebration. 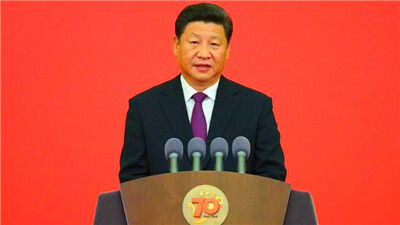 "No one should expect us to swallow bitter fruit that is harmful to our sovereignty, security or development interests," said Xi, also general secretary of the Communist Party of China (CPC) Central Committee and chairman of the Central Military Commission (CMC), during a speech at a ceremony to mark the 90th anniversary of the People's Liberation Army (PLA). While hailing the PLA's great achievements over the nine decades, Xi said the Chinese military has reshaped its political environment, organizational form, system of military strength and work style over the past five years. The PLA should firmly safeguard the CPC's leadership and the socialist system, protect national sovereignty, security and development interests as well as regional and world peace, Xi told senior officials and military personnel gathered at the Great Hall of the People in Beijing. "The Chinese people love peace. We will never seek aggression or expansion, but we have the confidence to defeat all invasions. We will never allow any people, organization or political party to split any part of Chinese territory from the country at any time, in any form," Xi said. The ceremony was presided over by Premier Li Keqiang and also attended by Zhang Dejiang, Yu Zhengsheng, Liu Yunshan, Wang Qishan and Zhang Gaoli, all members of the Standing Committee of the Political Bureau of the CPC Central Committee. Xi's speech came two days after China held a massive military parade involving more than 12,000 service personnel at the Zhurihe military training base in north China's Inner Mongolia Autonomous Region. "Today, we are closer to the goal of the great rejuvenation of the Chinese nation than any other time in history, and we need to build a strong people's military now more than any other time in history," Xi said in Sunday's speech. The PLA has come a long way since its birth at the Nanchang Uprising on August 1, 1927. Today, the PLA commands about two million service personnel. Xi told Tuesday's gathering that the armed forces had transformed from a "millet plus rifles" single-service force, one with only the most basic of supplies and equipment required to survive, into one that has fully-fledged services. The PLA has basically completed mechanization and is moving rapidly toward "strong" informationized armed forces, he said. Xi attributed the PLA's success to its glorious traditions and fine conduct under the leadership of the CPC. "The armed forces must follow the banner, the direction and the will of the Party at all times and under any circumstances." Xi noted, saying that the principle is an irreversible truth that the CPC has attained in struggles of blood and fire. Behind the PLA's glorious victories are also ideals and beliefs, as well as the reform determination, Xi said. "Only by continuous reform and innovation, can the people's army constantly gain development vitality and put itself in an impregnable position," Xi said. The PLA must be bold in reform and adept in innovation while staying away from rigidity and stagnation, he said. The president also stressed the role of fighting spirit, revolutionary discipline and civilian-military unity in claiming victories. As long as the armed forces stand with and win the support of the people, a "wall of iron" can be fortified, Xi said. Since the 18th CPC National Congress in 2012, the Party has put forward the goal of building a strong military that follows the Party, fights to win and forges exemplary conduct, Xi said. The Party has strengthened political work within the armed forces and made firm efforts to ensure a clean environment and fight corruption in the military, according to Xi. A series of major structural reforms have been made in recent years, including the establishment of the PLA Army General Command, the PLA Rocket Force and the PLA Strategic Support Force. The four general departments were reorganized into 15 agencies of the CMC, and five theater commands have replaced the seven military area commands. The CMC has taken charge of the overall military administration, while theater commands focus on operations and different services on troop developments. "The system, structure, pattern and image of the people's military have all been renewed," Xi said. Moreover, Xi said the fundamental changes have taken place in the governance of the military. Putting combat effectiveness as the "sole and fundamental" standard for the military, the PLA remains resolved in safeguarding the country's territorial sovereignty and maritime rights and interests. Xi reaffirmed the CPC's absolute leadership over the PLA. which is a "fundamental guarantee" for the army to maintain its great cohesion, creativity and combat capabilities. Quoting Mao Zedong, the founder of the People's Republic of China, Xi said: "Our principle is the Party commands the guns, and we will never allow the guns to command the Party." He ordered the PLA to always follow the command of the CPC Central Committee and the CMC. "There shall be no wavering, no hesitation, and no ambiguity." The CPC has put forward a series of new ideas and requirements concerning national defense and military building in the past five years.These theories should be constantly enriched and developed to cope with new challenges and solve new problems, he said. Xi urged the PLA to focus on war preparedness to forge an elite and powerful force that is always "ready for the fight, capable of combat and sure to win." "All thoughts must be put on combat, and all work should focus on combat so the military can assemble, charge forward and win wars any time the Party and the people need them to," he said. Xi called for a new generation of "capable, brave and virtuous" service personnel "with soul." The PLA must have ironclad faith, beliefs, discipline and responsibility, and retain its nature and goal as the people's army, he said. The PLA must step up efforts to build a modern military force system capable of winning information-based warfare, he said. China must build a national strategic system and capacity in military-civilian integration, he said. Upgrading integrated military and civilian development as a national strategy is a major decision made in consideration of national development and overall security, and a major measure to deal with complicated security threats and gain national strategic advantages, Xi said. He urged efforts to create the "coordinated, balanced and inclusive development" of economic and national defense construction. Calling the modernization of national defense and military "a common cause of the Party and the people," Xi urged central and state organs, Party committees and governments at local levels to create a favorable environment and offer strong support for building a strong military. Xi also urged the armed forces to bear in mind the sacred duty of fighting for the people. The PLA is deeply rooted in the people and its strength comes from the people. It must maintain a close relationship with the people and "go through thick and thin" with them, he said. China has always been a builder of world peace, a contributor to global development, and an upholder of international order, Xi said. His words echoed his speech during Sunday's parade where he said: "The world is not all at peace, and peace must be safeguarded." "Enjoying peace is a bliss for the people while protecting peace is the responsibility of the people's army," he told the troops in field. The PLA will continue international military exchanges and cooperation to cope with global security challenges, Xi said in his Tuesday's speech. It will implement the responsibilities and duties commensurate with the country's international status and contribute to fostering a community of shared future for mankind, he said.